Edinburg, Texas Edinburg, the Hidalgo county seat, is on U.S. Highway 281 and State Highway 107 in the south central part of the county. It is part of the McAllen, Pharr, Edinburg metropolitan area. Hidalgo, on the Rio Grande, was the original county seat. During its early years it served a ranching community, but the arrival of irrigation in 1915 initiated an agricultural economy. Edinburg quickly became a center for buying and processing cotton, grain, and citrus produce. By tradition, Edinburg is a Democratic stronghold that reflects county politics. The governing body consists of five commissioners, including the mayor, who administers through a city manager. 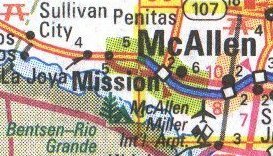 McAllen is on U.S. Highway 83 about sixteen miles west of Weslaco and thirty-five miles west of Harlingen in southern Hidalgo County. In 1911 the town applied for and was issued a charter of incorporation under the name McAllen. In 1916, 20,000 New York state troops were stationed at McAllen to help with border disturbances. The resulting economic boom increased the population from 1916 to 1920. Between 1937 and 1942 the United States Farm Security Administration and the Farm Placement Service of Texas established a camp in what is now east central McAllen. Pharr, Texas Pharr is on the Missouri Pacific line and old U.S. Highway 83 (U.S. Spur 347), five miles west of McAllen in south central Hidalgo County. Pharr incorporated in 1916. In 1919 Pharr, San Juan, and Alamo established the Pharr-San Juan-Alamo Independent School District. San Juan is located just east of McAllen toward Weslaco along old U.S. Highway 83 near the Rio Grande River and the United States/Mexico border. It was incorporated in 1973. Weslaco, about fifteen miles west of Harlingen in south central Hidalgo County, is on U.S. Highway 83 and Farm Road 88. In an effort to control raids from Mexico, the United States government stationed troops along the Rio Grande in 1916 and established a camp at the Llano Grande railroad depot, located between Mercedes and the site of Weslaco. Weslaco is surrounded by many colonias, including Sun Country Estates, Expressway Heights, Sunrise, and Sunrise Hill. The estimated combined population of these four was 1,600 in 1986, when they consisted of about 355 dwellings. Harlingen, Texas Harlingen's strategic location at the intersection of U.S. highways 77 and 83 in northwestern Cameron County; was incorporated on April 15, 1910. Harlingen has a busy port on a channel connected to the Gulf Intracoastal Waterway, near Brownsville. World War II military installations in Harlingen caused a jump in population between 1950 to 1960. Harlingen Army Air Field preceded Harlingen Air Force Base, which closed in 1962. The city of Harlingen operates a busy industrial airpark where bombers used to land. At Valley International Airport the Confederate Air Force occupied hangar and apron space until 1991. San Benito is on U.S. Highway 77/83 five miles south of Harlingen and twenty miles north of Brownsville in Cameron County, at the approximate center of the county. The first meeting of the city council was held on July 27, 1911. A city manager form of government was adopted by charter in 1920. During the border disturbances of 1915-16, San Benito was a base for troops of the Oklahoma, South Dakota, and Tennessee National Guard. Several fights with bandits occurred in the area, involving troops and Texas Rangers. In 1990 the city was governed by a mayor and four elected commissioners, with a city manager as administrative head. Brownsville, Texas Brownsville, Texas, on the Río Grande, near the Gulf of Mexico. It is the seat of Cameron County. Brownsville is a port of entry across the river from Matamoros, Mexico, to which it is linked by two bridges. 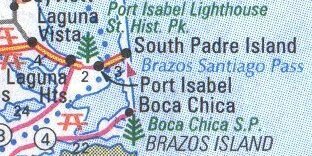 Brownsville's deepwater port is at the head of a channel that is the southern terminus of the Intracoastal Waterway, and the city is served by the Brownsville/South Padre Island International Airport. Fort Texas, later renamed Fort Brown for Major Jacob Brown who died defending it, was established at the site by General Zachary Taylor in 1846 to confirm the Río Grande as the national border. South Padre Island is a resort community on Park Road 100 at the southernmost tip of Padre Island in Cameron County. The island had become a resort during the mid-nineteenth century but was not developed until the 1950s after the completion of the Queen Isabella Causeway, now the Queen Isabella State Fishing Pier. The $2.2 million swing bridge connecting Port Isabel to South Padre Island was completed in February 1954.